Zoetropic – Photo in Motion for Android is an app that gives life to your photos. The app has loads of fantastic motion picture effects also called as cinemagraph effect is perfect for those who love to create spectacular around the memories you have built over the years. You have the mask tool, movement tool and stabilization tool and much more features to make a motion picture with all the photos you have selected. The resultant output after applying the effect is a video which can be shared with everybody. Zoetropic – Photo in Motion Android app offers tools of that help you add fascinating effects to the still images. The 5 main tools are, motion tool, sequence tool, stabilization tool, select tool and mask tool. The sequence tool is used to add a sequential motion to the selected portion of the image. The stabilization tool prevents a certain point from moving around. You just have to add points around the area and it will not move. The select tool erases all effects like the motion and stabilizations within the selected area. The mask tool prevents the masked area within an image from moving. Move and stabilization tool can be used together to get the perfect motion of the rest of the image. The motion too is one of the most important one of all the tools as it lets you add motion to the selected area of an image. The edited images will be saved as video files and shared on different social media platforms. 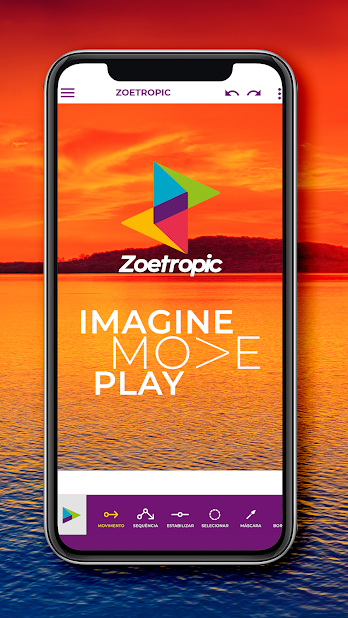 As you share, use #zoetropic hashtag and tag @zoetropic_app in instagram and if your photo is selected it will be featured in an official website. Zoetropic – Photo in Motion for Android enhance the popular hobby of majority of the population, which is, clicking photos and editing them to our liking. There are quite a lot of photo editing apps available but Zoetropic stands out with the kind of tools that brings life to the still images. The app costs $1.99 and there are other features available as in-app purchases. Even the undo feature is made available in the paid version. There are advertisements flashed at regular intervals.